Honeycrisp apples will never win the beauty prize. That -- and the premium price required by their finicky cultivation requirement in central Kentucky -- kept them in the back of Reed Valley Orchard's farm stand at the Lexington Farmers Market for all the years I've been a customer -- until now. The big news is that Honey Crisp apples are in the front row at Reed Valley Orchard's stand this year. The apples are HUGE from the rains of spring and early summer, and -- thanks to Dana Reed's persistence in learning to grow these treasures a couple of zones south of their preferred climate -- they are the same price as all the other fabulous apples (Macintosh/Ginger Gold/Sweet 16/Liberty/Cortland and many more). Typically Dana and Trudie Reed want every piece of fruit they sell to be beautiful as well as intensely flavorful and healthful. It gives me hope for the future of the world and us humans -- I'm not kidding -- that many people buy Honeycrisp in spite of its less than stellar looks. 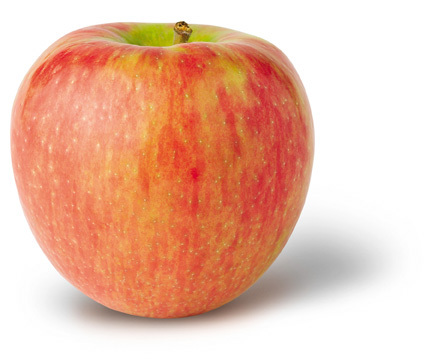 Flavor and texture (inner beauty) make Honeycrisp the object of apple lovers' ardent pursuit, thank goodness. I have enjoyed my membership in the semi-secret society of People Who Know About Honeycrisp, and know enough ask for them and go looking for them at the Reeds' farm stand. I happily give it up, though, In honor of this big success for Dana Reed, who willed the Honeycrisps to succeed a couple of zones farther south than might be ideal. Read more about Dana and Trudie Reed's commitment to bringing wonderful fruit to central Kentucky here. Photo: Courtesy of New York Apple Association. Thank you!